Nuclear Explosion Map - Find Out If You're Safe? It’s like watching a car wreck, you don’t really want to see it, but can’t quite look away. That’s exactly what it’s like when you visit this Nuke Map Website. At least in the cold war days, the massive game of chicken was offset by horrors of mutual destruction. Nowadays, a nuke in the hands of terrorist makes the mutual standoff much less likely. Suicide bombers don’t care about mutual destruction…to them, that’s the point. Or how about a rogue nation like North Korea which continues to progress their nuclear capabilities and reach. It’s only a matter of time for this highly unstable nation to be capable of reach the western coast of the mainland U.S.
What Are A Nuclear Armed Terrorists Primary Targets? The answer is pure speculation and a discussion worthy all on its own…however we can make a few reasonable guesses. I’d guess that a terrorist with a nuke would want to get the best possible return on investment…deaths. More deaths = more terror (and terrorists are in the business of terrorizing). That makes me think that they would attack locations that have high population density. Major cities or large events. Places where they will get a high death count. The other locations I would suspect could be a target is any U.S. military of U.S. government facilities (white house, federal buildings, air-force bases, etc.). Here’s a website that gives you maps of the state by state nuclear threats. It’s a bit older (2002), but it still provides relevant visual nuclear threat data. What’s The Best Way To Avoid A Nuclear Threat? The best ways to avoid a threat is to not live in a major city. Hopefully, you do not…but what about your extended family? Do you have an Uncle in New York? A Sister in Denver? A Grandparent in San Francisco? In my opinion, living near the most densely populated cities carries a lot of risks. 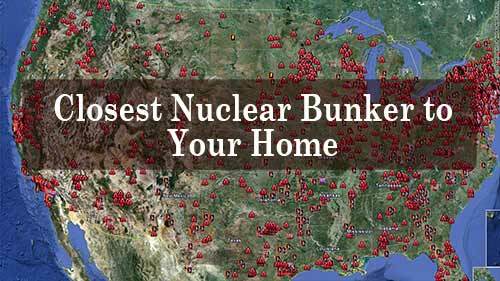 I suggest you share this nuclear explosion map website with friends and family. I live in San Diego about 15 miles from the Navy base. If we are hit by a nuke is better if we get Into our boat and get as far away as possible or is better to go into our basement underground where we would possibly be protected by the radiation? Better to avoid exposure as much as possible. So get in your basement and don’t leave for a long time (so stockpile food/water/resources). The act of leaving after the explosion would likely expose you to high levels of radioactive fallout. Maybe you get lucky and the prevailing winds are away from the ocean but are you willing to bet your life on that?